Alright, I’m salivating looking at the pictures of this unbelievable mole-inspired pork shoulder (MOLE-lay). You see, I often blog at night before I go to bed, which means I’m just starting to get hungry. It’s been a few days since we had this delicious meal, but now I’m thinking that I may have to make it again this weekend. I’m not sure I’ll be able to prepare pork shoulder any other way (that might be a lie, but dang– it’s really amazing!). I love the varied spice combination here. Combining the cocoa and cinnamon, along with the pork works perfectly– they compliment each other so well. We were able to enjoy two meals out of this one pork shoulder. The first time we made shredded tacos served with chunks of avocado and lime. Wowzer! Then we made these fantastic savory cornmeal cakes to go with it the next night. The cakes were perfect, they were substantial and best of all, had that nice ‘toothsome’ bite. The flavor of the cornmeal was a nice base for the the intriguing mole flavors. A few things to consider when you make this. Sometimes it’s difficult to get the exact amount of meat listed for recipes. If you can’t find a 2 1/2 pound pork shoulder, or would just like to make more (because the leftovers are fabulous) just get a bigger one. Increase the amount of the seasonings a little, and cook it a bit longer. It’s not a big deal at all– one of the joys of cooking is getting confident enough to make changes and substitutions as needed. Remember, it’s just food. Take control of it and make it your own. 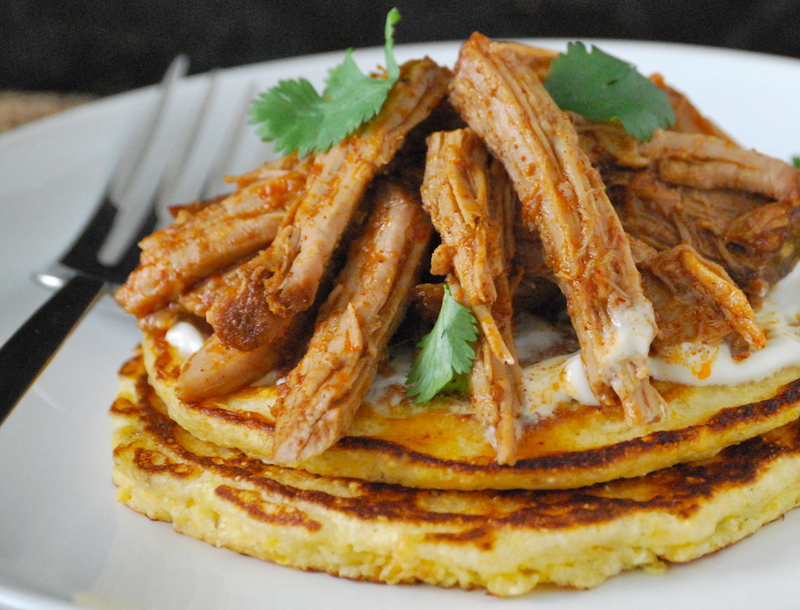 Enjoy the pork shoulder on either the cornmeal cakes or as tacos. They’re brilliant! In a medium sized bowl, add all of the dry ingredients. Stir with a spoon, or use your fingers like I do, until thoroughly combined. 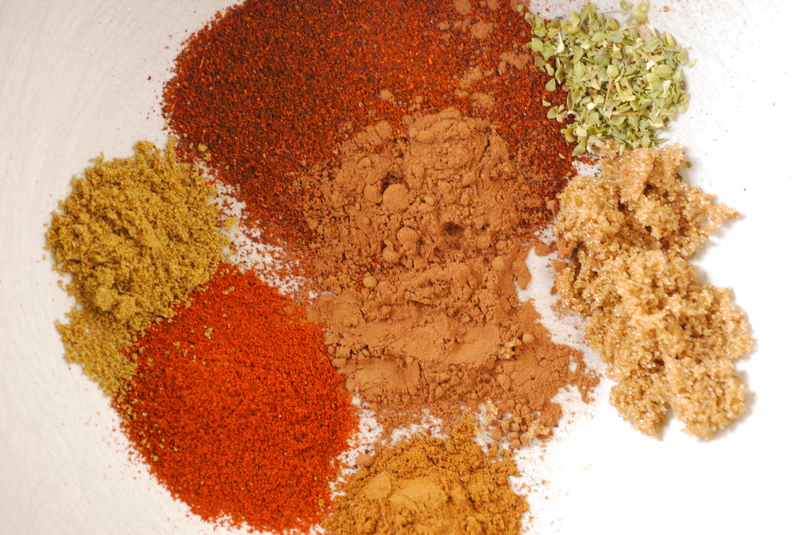 Place pork shoulder on a plate and rub the spice mixture all over it. Let sit at room temperature for 1 hour, or in the refrigerator for 2 – 24 hours. Preheat oven to 275°F. Place the pork shoulder in a Dutch oven, or a similar pan of some sort that is deep and has a lid. (If you don’t have either, you can also wrap the pork shoulder in aluminum foil, making sure the seam is at the top, so the juices don’t seep out. Then place in an oven-proof skillet or casserole.) Add the garlic cloves to the pan. Place a sheet of aluminum foil over the top of the Dutch oven and then place the lid securely on it. Roast the pork until it is very tender and falling off of the bone, about 2 hours. When it is done, transfer to a platter and cover with foil. Defat the juices by putting them in the freezer for 10 minutes and then spoon the fat off with a spoon. Shred the pork with two forks and pour the juices over the top of them. Heat a large skillet over medium heat and brush the surface with butter. Pour the batter onto the pan, 2 tablespoons at a time works well. Cook the cakes until they bubble at the surface and set and the edges on the underside are brown. Flip them and continue to cook. Repeat until all of the batter is gone, making sure to butter the pan each time. Serve as soon as they are done, or keep warm, covered with tea towels in an oven warmed to 200°F. 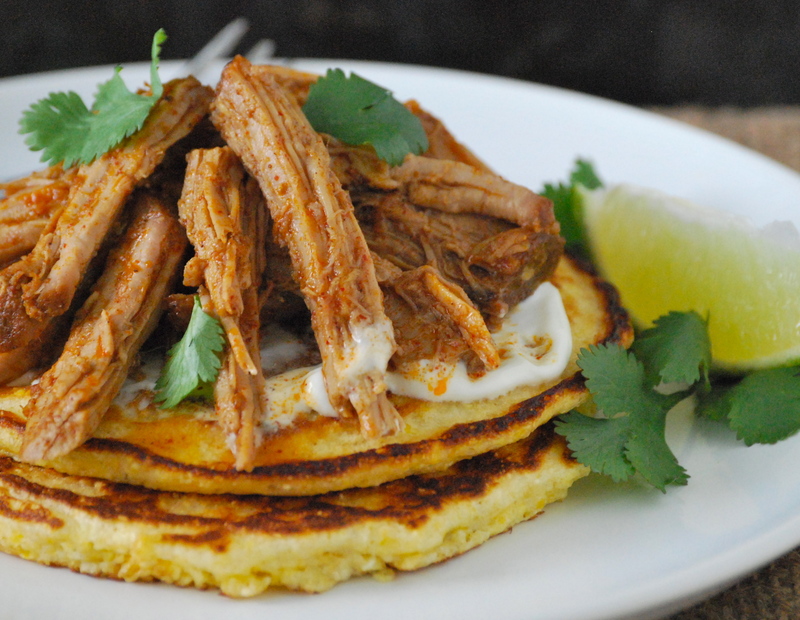 Serve the pancakes smeared with sour cream and piled high with the mole-inspired pork shoulder. A squirt of lime juice and a few sprigs of cilantro will complete the meal nicely. Enjoy! Sometimes I miss eating meat, and I miss pork most of all. A good slow-cooked pork, rich with spices and succulent with pork fat flavor is a thing of beauty. Like the pork at our December party, it just resonates with me. Thankfully I can live vicariously through this blog post, as it looks just fantastic. Thanks, Kate. I’m sure you do miss meat from time to time — but just think of how much better you feel these days! At any rate– you can have a bite here and there, right?! Thanks Jolene — you are always so sweet. I’d been planning to make chicken mole lately but never did. This though? Looks terrific. Looks tasty. But–I’m confused, as there are no cracklings in the cornbread cakes. What makes them crackling cakes? Hi Sally. The crackling is referring to the texture that the cornmeal imparts onto the cakes.